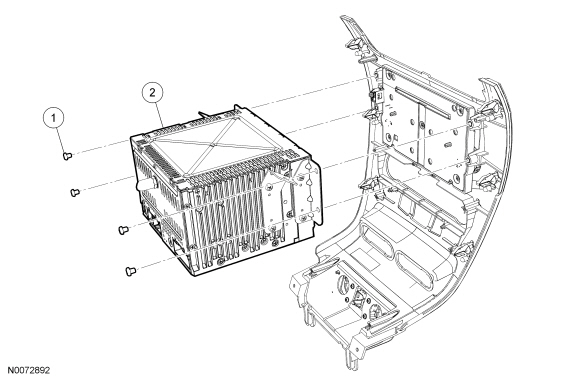 It is not necessary to remove the Audio Front Control Module (ACM) in order to retrieve the part number. For additional information, refer to Audio Control Module (ACM) Self-Diagnostic Mode in this section. Module configuration is only required if a new ACM is being installed. Upload the ACM configuration information to the scan tool. For additional information, refer to Programmable Module Installation (PMI) in Section 418-01. Remove the instrument panel center finish panel. For additional information, refer to Section 501-12. Remove the 4 screws and the ACM . Download the configuration information to the ACM . For additional information, refer to PMI in Section 418-01.